As mentioned in my interview with Eleanor, I’m currently running two giveaways where you can win a free copy of The Last Ereph and Other Stories. For paperbacks, head on over to Goodreads to enter. There will be two winners there and each will receive an autographed copy of the book. It only runs until Monday (March 30) so hurry on over! For eBooks, head on over to Librarything to enter. More copies available there although, alas, I can’t autograph an electronic file. Sorry, folks. This one runs until next Monday (April 6). Via Slate, here’s an interesting little website that combines lots of three-letter airport codes with images taken from each one. As an added bonus, you get how that airport got its code, from the perfectly logical, like CRW (Charleston, WV), the lost in the mists of time, like ORD (O’Hare), and the still not making much sense, like YYZ (Toronto). Wait, did someone mention YYZ? Win a Copy of The Last Ereph and Other Stories! Over at Librarything, you can currently enter to win a free eBook copy of The Last Ereph and Other Stories. Giveaway ends on April 6 and only 100 copies are on offer, so head over and get your entry in today! For those paperback folks, look for another giveaway at Goodreads later this week. Weekly Listen: Hand. Cannot. Erase. 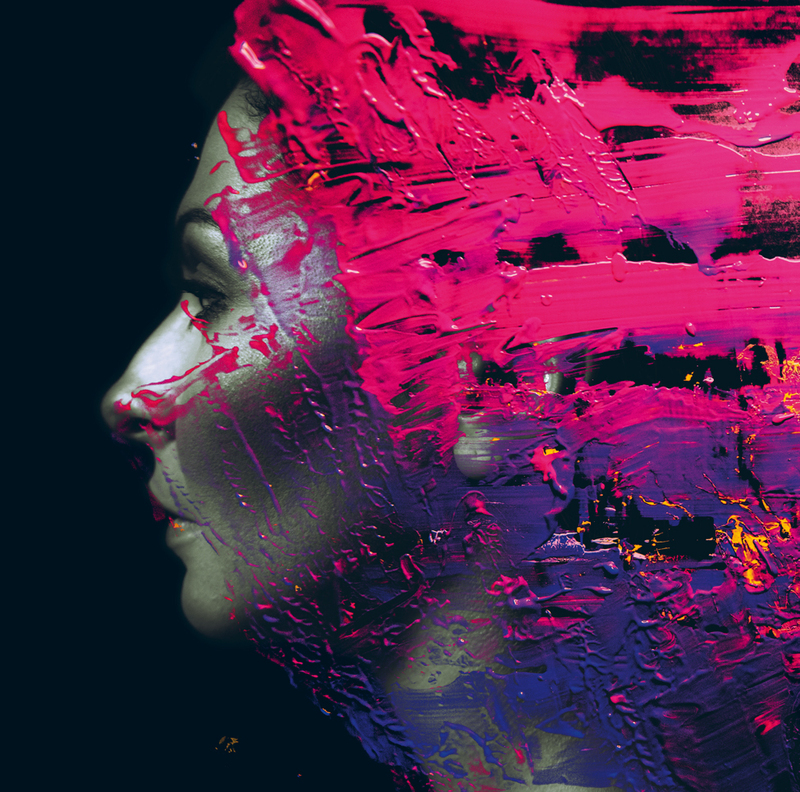 Without a doubt, Steven Wilson is the modern standard bearer for progressive rock. Over the course of four solo albums since putting Porcupine Tree on hiatus, Wilson has reached a standard of success other proggers just dream of. All right, he’s not Katy Perry, but his new album, Hand. Cannot. Erase., debut not just in the charts in Europe but near the top of several. For a guy who’s spent the last few years channeling King Crimson, Yes, and a host of other terminally unfashionable bands (while remixing chunks of their back catalogs), that ain’t bad. What’s more, Wilson’s done by producing four albums that are distinct from each other but still sound clearly like him. Where The Raven That Refused to Sing (and Other Stories) fully embraced its 1970s proggy roots, Hand. Cannot. Erase. casts a wider net, harkening back not only to some of the more tuneful bits of Porcupine Tree (think Stupid Dream or Lightbulb Sun) but also other Wilson projects like Blackfield or even No-Man. As a result, the album is more accessible, but no less interesting. Each track, whether it’s an acoustic vocal piece or a frenzied prog workout, is deftly constructed and performed. The performance comes largely from the band assembled to tour Grace for Drowning (and which made The Raven . . .), with some interesting additions, including a choir and some effective strings (arranged by the ever talented Dave Stewart). Wilson does a lot of work himself, but he leaves the spotlight stuff to others, particularly guitarist Guthrie Govan, who has his usual shreddy self reigned in somewhat, to great effect. There’s even a piece that’s basically spoken word, although I think it’s probably the weakest effort here. Hand. Cannot. Erase. is a concept album, inspired by the story of Joyce Carol Vincent – a woman who died in her apartment and wasn’t found for three years. She reportedly wasn’t a loner or recluse, had friends and family. Wilson was drawn to the story by wondering how she got there. As a result, this is kind of like Wilson’s run at Brave, the Marillion album inspired by a BBC report about a uncommunicative girl wandering on the Severn Bridge. The album is Steve Hogarth’s attempt to figure out how the girl got there. The comparison is inevitable and, unfortunately, Hand. Cannot. Erase. suffers for it. Hogarth and company are expert at picking you up and wringing every bit of emotion out of you. You feel for the girl in Brave, even if you never quite understand what went on in her head (there are also some broader swipes at the society in general that might have driven her there). Wilson doesn’t work the same way, preferring a more detached observational approach. He’s very Kubrickian in that way, which isn’t a bad thing (I loves me some Stanley), but it does make for a stark contrast. Last week marked the anniversary – the 37th, to be exact – of the debut of The Hitchhiker’s Guide to the Galaxy, in the form of a BBC Radio play. In the decades since it’s conquered just about every form of media – books, TV, film, video games, the Internet. It’s been one of my favorite things in the world since my brother introduced me to it lo those many years ago. Part of that is almost certainly because that’s the version I experienced first. I think (it’s been a while, after all). But I also think that the TV show comes the closest to getting it “right,” if there can be a “right” for Hitchhikers, given that Douglas Adams was involved in all the various permutations. I think that comes down to two things. Wouldn’t life be better if Wikipedia worked that way? The other thing that I think works in the TV show’s favor is, perhaps counter intuitively, it’s tiny budget. I’m not talking cheap – to paraphrase Frank Zappa, cheap has nothing to do with budget, although it helps – but it’s clear there were certain limitations that the BBC crew were working under when producing the series. It looks low budget because it was, but it’s not cheap. But the low-buck approach yields an interesting benefit in that it comes across almost more like a theater production, where the audience has to buy into a willing suspension of disbelief to enjoy things. Yes, we know Zaphod’s second head and third arm are clearly fake props, but so what? It might even work better that way. Science fiction is at its best when, in spite of its setting or embrace of gee-whiz tech, it’s holding up a mirror to humanity as we know it now. It’s true for comedic work like Hitchhiker‘s as well as more serious stuff. That’s sometimes harder to do in the modern CGI world. 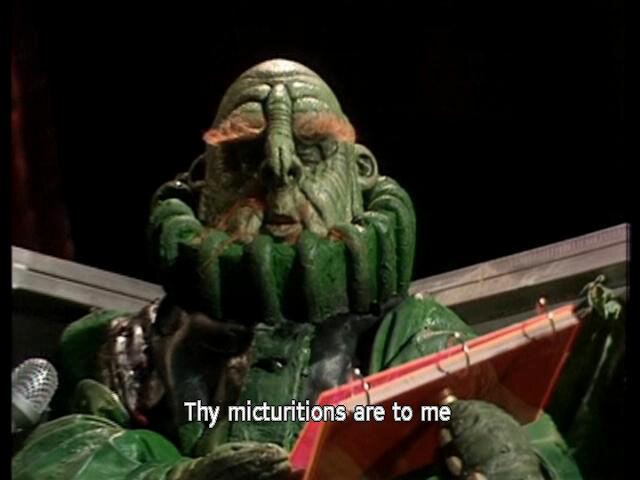 Take, as one example, the Vogons, Adams’s ultimate bureaucratic nightmares and purveyors of bad poetry. The movie version looks “better” in just about every conceivable way, including the fact that they are terribly alien. But does that serve the story more effectively? The TV Vogons look like people in rubber suits and, as such, are still somewhat recognizable as people. Which is appropriate, since the Vogons aren’t really something that sprang fully formed from Adams’s brain from nothing. They’re formed from our own real world experience – they are the ultimate cold blooded government functionaries. They may be an exaggerated form of one of humanity’s worst traits, but they’re nonetheless rooted in humanity. 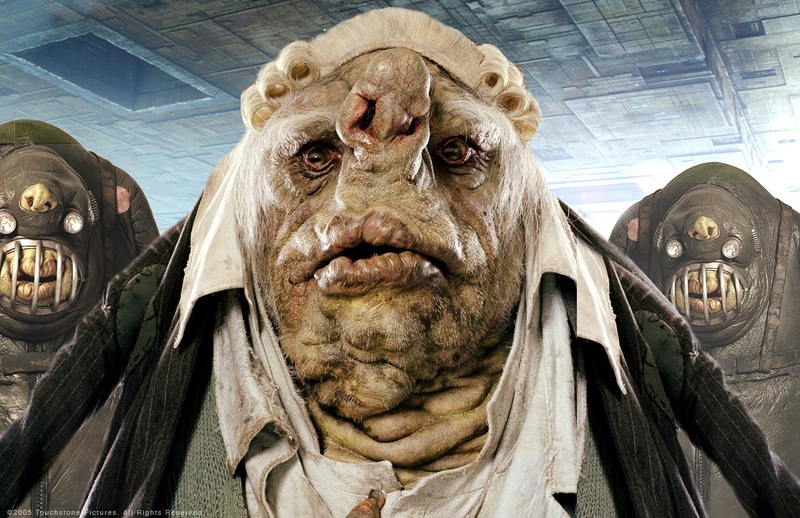 The movie Vogons, but contrast, are really alien. They’re different enough that the connection to our own world is lost. It doesn’t make the story worse, but the jokes don’t land quite as hard when they aren’t as grounded in reality. None of this is to say that anyone else is wrong for having another version of Hitchhiker‘s as their favorite. That’s one of the coolest things about it – it’s reached out so many ways that it doesn’t matter if you’re a reader, a watcher, or a listener. Regardless, you’ve got a great place to jump in. Just remember – bring a towel. * Actually, that’s not completely true. The first thing that usually pops into my head is the line about how Vogon ships hang silently in the air in “the way that bricks don’t.” Utter brilliance. My first exposure to “The Cold Equations,” a short story by Tom Godwin first published in Astounding magazine in 1954, was in a college sci-fi and fantasy class. I didn’t take the class – my roommate did. But he shared the story with me and we talked about it quite a bit. The story, very briefly, is this: a pilot is guiding a small spacecraft to a distant colony carrying medicine to help stop a fatal disease outbreak. The ship is lean and purposeful, with just enough fuel to do the job with the expected payload. Problem is, there’s a stowaway – a teenage girl who wants to see her brother, one of the colonists. After some agonizing, the pilot does what the rules – and the laws of physics, the nominal cold equations – require him to do: push her out an airlock. For, you see, with the extra weight of the stowaway there isn’t sufficient fuel for a safe landing. Save the girl, the ship crashes, and all the colonists die. The ending of the story has caused arguments since it was first published, I imagine. My roommate and I had a good one, with me taking the side of, “this is stupid, there should have been something done to prevent this from happening.” It was one of those things that college arguments are built on. This time last year Boing Boing maven and sci-fi writer Cory Doctorow wrote a piece for Locus Online essentially taking the same position I did all those years ago. Doctorow is entirely correct, as I was years ago, that things could have been set up differently to allow for a happier ending – one where the stowaway survives and the colonists don’t die of a nasty disease. But I disagree with him when he concludes that the absence of those things makes the story a failure. Two of his arguments don’t quite sit right with me. ‘The Cold Equations’ is moral hazard in action. It is a story designed to excuse the ship’s operators – from the executives to ground control to the pilot – for standardizing on a spaceship with no margin of safety. A spaceship with no autopilot, no fuel reserves, and no contingency margin in its fuel calculations. That’s an odd accusation for a fiction writer to make. Fiction is the ultimate contrivance. Writers move pieces around and put them together in particular ways to tell particular stories. That’s why in a legal drama the hero isn’t just defending an innocent man charged with murder, but his brother, or why the cute girl the guy hooked up with the night before isn’t just in the same line of work, she’s the main rival for the new account. It can be a cheap way of ramping up the conflict, but it’s hardly unheard of. Obviously one can critique a story for being overly contrived and unrealistic, but we are talking about a short (10,000 words, about) tale set on a spaceship. There’s not a whole lot of room to explore the facets of this universe that don’t focus on the central conflict. It’s a story about the rather obvious, yet compelling, theme that space is a dangerous place and it doesn’t care about the humans caught up in it. The second argument is more implicit than explicit, but it comes up when Doctorow cites the litany of means the story could have used to avoid the tragic ending, from better engineered spaceships to better medical care at the distant colony in the first place. All of these are true, of course – something could have been done. But that misses a key point – is it unreasonable to think that in the universe of “The Cold Equations” such things might not happen? Assuming the story is set in a future period of our own history it certainly isn’t. History is riddled with tragedies that occur when some entity cuts corners on safety. I don’t even have to look beyond West Virginia to find plenty of examples – mine explosions, the Buffalo Creek flood, the Hawks Nest Tunnel disaster. All caused because safety was sacrificed for something else, either profit or political expediency. Or just plain dumb assery. Is there any reason to think the powers that be in the universe of “The Cold Equations” are better human beings than we are now? After all, there was a sign warning unauthorized personnel not to enter the ship. Is it too harsh to say anybody who ignored that sign got what she deserved? Yeah, but that wouldn’t stop people from saying so. Scour any Internet comment section in the wake of some tragic accident and there are plenty of people willing to blame the injured for their predicament. Again, there’s no reason to think citizens in the universe of “The Cold Equations” would look at the incident any differently. In the end, Doctorow’s main criticism of “The Cold Equations” seems to be that it’s not set in the best of all possible worlds, one where everything possible to prevent such a tragic event from taking place would be done. But that world is a fantasy, one harder to believe in that most of what’s on sale in the bookstore. Perhaps one of the reasons it’s endured all these years is that as readers we know it’s all too plausible. * OK, so, technically supplies are unlimited – it’s an eBook, after all – but that sounds so much more urgent, doesn’t it? Neil Gaiman’s newest book, Trigger Warning, is a collection of short fiction (and a few poems) that, as with most such things (although not this one! ), is made up mostly of works that have appeared elsewhere. Moreover, many of these stories were prepared for certain people under certain circumstances and, therefore, might not be the most representative of Gaiman’s original work. Nonetheless, it’s a pretty good collection, rising and falling (as it must) on the strength of each selection. The works tied to others include stories from the worlds of Sherlock Holmes, Dr. Who, and Gene Wolfe in addition to stories springing from a photo essay about David Bowie and Gaiman’s wife’s work as a human statue. It’s fun to see Gaiman work within these various confines, such as “A Calendar of Tales,” a series of 12 short short stories (one for each month) based on prompts drawn from readers. Of those stories the one that stood out most to me was “Nothing O’clock,” the Dr. Who story (set during the Matt Smith/Karen Gillan era). It’s got a hint of “Get ’em Out By Friday” in the setup (aliens buying up real estate) and is genuinely creepy. Gaiman makes good use of the fact that it’s a written story rather than a TV show, a well, with some imagery (and doppelgangers of prominent British folks) that you just couldn’t pull off on screen. The Holmes story, “The Case of Death and Honey,” doesn’t fare as well. Full confession – I’m not a Sherlock Holmes fan, so I’m not in the target audience. Nonetheless, the minute details of beekeeping that the story used got in the way of the larger story. I know from reading his blog that Gaiman has recently taken up beekeeping, so I can understand the desire to share a new passion, but it just didn’t work. Of the completely original works, several stand out. “The Thing About Cassandra” also starts out a bit like a Genesis tune (“Me and Sarah Jane” this time) with a guy being stalked by his imaginary girlfriend, but it takes a wicked twist in the end. “Orange” is a great story – of a girl who achieves a kind of malevolent ascendance – told in a really neat way – it’s entirely made up of answers to questions posed to a witness to the events. Meanwhile “My Last Landlady” involves a guy who – well, let’s just say his need for a landlady doesn’t go away because he buys a nice house in the country. But two originals are the best reason to get this collection. The first, “The Truth Is a Cave In the Black Mountains . . .,” began life as a mixed media thing, with Gaiman reading the story on stage, complete with background illustrations and music from a string quartet. In spite of that, the story – an atmospheric tale of revenge and, well, truth – works really well just on the printed page (or, on the Audible version, with Gaiman narrating). It’s one of those classic Gaiman stories that sounds like it should take place in the real world but thankfully doesn’t. The second is “Black Dog,” which is not based on the Led Zeppelin tune but rather is a further entry in Gaiman’s own American Gods cannon. Shadow is still wandering, this time finding his way to a pub in the English countryside that, at one point, had a mummified cat built into the walls. He falls in with a couple that has some secrets (naturally) which requires Shadow to get in touch with one of his deific pals. It’s a cracking read, full of weird and chilling little details. The Last Ereph and Other Stories Available Now! The Last Ereph and Other Stories, my collection of short fantasy and science fiction stories, is now available! Get more details on the book, including links to order in paperback or your favorite eBook format here.